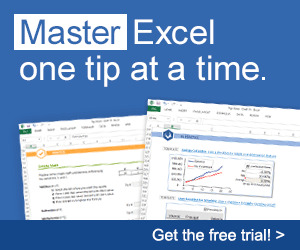 If you want to produce a more formatted worksheet, you can prepare an Excel template and format it as needed — for example, adding a large, centered title and column headings with appropriate text, perhaps in a larger or bolder font than the data area. Then, instead of using the Excel command on the Ribbon, use VBA code to export the Access data row by row to the data area of a new worksheet created from the template. I created a set of queries for archiving data, again using the sample Northwind data, and a dialog form (fdlgArchiveOrders) that allows the user to select a date range for archiving Orders data, as shown in Figure 3.5.
. >jrr Note the calendar icon next to the date controls (it appears when a control bound to a Date field has the focus). Clicking the icon opens a calendar for selecting a valid date, as shown in Figure 3.6. The new calendar pop-up is definitely useful, though selecting a date far in the past can be tedious, because there is no way to move year by year. 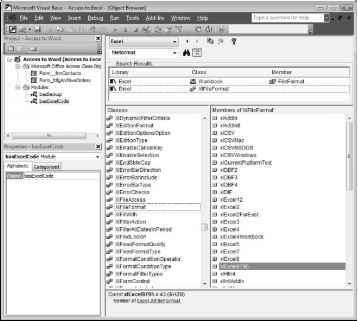 A dialog form for selecting Northwind Orders data to archive. Selecting a date from the calendar pop-up. 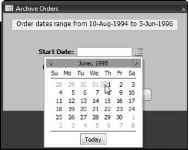 Once the start date and end date have been entered or selected, clicking the Archive button runs a procedure that creates a new Excel worksheet from a template (Orders Archive.xltx) in the same folder as the database, fills it with data from tblOrders in the selected date range, and deletes the archived records. strPrompt = "No orders found for this date range; "
& "canceling archiving" strTitle = "Canceling"
MsgBox strPrompt, vbOKOnly + vbCritical, strTitle GoTo ErrorHandlerExit Else strPrompt = lngCount & " orders found in this date "
& "range; archive them?" strTitle = "Archiving"
Put up a success message, listing the name and path of the new worksheet: strTitle = "Workbook created"
|Wfc 3frJ.rtXiShjS Figure 3.7 shows this reference checked in the References dialog, which is opened from the Tools menu in the Visual Basic window. Setting a reference to the Excel object model. After the worksheet of archived records has been created and saved, you will get a message (depicted in Figure 3.8) listing the location where the archive worksheet was saved. A success message after records are archived. After the code deletes the archived records — first the ones in tblOrderDetails (the "many" table) and then those in tblOrders (the "one" table) — a final message appears, as shown in Figure 3.9. A final informative message stating that the archived database records have been cleared. A worksheet filled with archived data is shown in Figure 3.10. A worksheet filled with archived Access data. Viewing the file format choices for saving an Excel workbook. If you create a worksheet in the new .xlsx format, only Office 2007 users will be able fciiK^jadfagia»- to open it. To create a worksheet that can be opened and edited by users with earlier versions of Office, select one of the other formats. The Excel 97-Excel 2003 Workbook (.xls) format (shown being selected in Figure 3.12) is usable in Office 97 through 2007, so it is generally the most useful worksheet format. Selecting a worksheet save format. i : ' IF)" r ^°Pen the Object Browser for examining components of an object model, open the visual Basic window and select Object Browser from the View menu, or press F2.